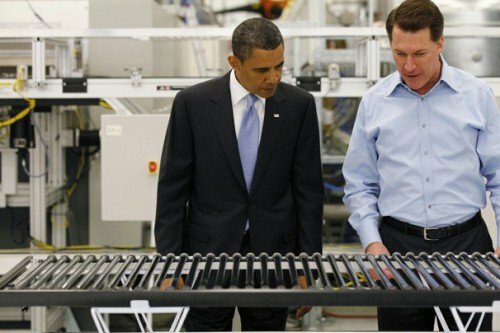 The Republican National Committee today released an e-mail from Solyndra CEO Chris Gronet from 2009, labeling the Obama administration as “The Bank of Washington” and boasting of several ways in which the company could exploit federal programs and tax breaks in order to keep the soon-to-be-doomed company afloat. The Bank of Washington continues to help us! Within the $535 million loan to Solyndra were a number of sub-awards to other vendors, 40 payments of which were greater than $25,000 each. The largest sub-award went to CH2M HILL, to the tune of $9.6 million for their construction engineering services. CH2M used the nearly $10 million sub-award to design Solyndra’s solar manufacturing plant in Fremont, California. He added, “This work was secured through an open, competitive, and transparent procurement process,” a contradiction to the aforementioned Washington Post report which stated that consulting firms had essentially shaped and awarded themselves pieces of the stimulus. With millions of dollars having been secured, CH2M clearly outdid themselves on the Solyndra project, building a facility the likes that had never been seen before in the heart of Silicon Valley. The facility covers 300,000 square feet, ran a price tag of $733 million, and was equated by some to the Taj Mahal. Bloomberg News reported on some of the extravagant amenities—amenities which might surprise for a company using taxpayer funds to maintain operations. Another company that assisted CH2M Hill in the design of the Solyndra facility also declined comment. Erik Sueberkrop, of Studios Architecture, was on the design team for the manufacturing and office facility in Fremont, California. He stated only, “As I am not at liberty to discuss, there is no comment at this time.” The Studios website meanwhile, has scrubbed detailed links to the facility’s architecture, interior, and planning links. While the building remained a feat of engineering, neither company saw fit to take credit now that the Solyndra scandal has broken. Each declined comment when asked to provide images or blueprints of the facility, and ignored a request to provide expense reports for the use of their stimulus money on the Solyndra project. It would appear that both Solyndra and CH2M Hill executives did indeed work the earmark politically, and the “Bank of Washington” was more than willing to oblige. In the wake of several Energy Department scandals it is important to analyze how taxpayer funded projects have developed, and what mistakes were made along the way. It is not a time to rush infrastructure funding in the hopes that temporary jobs will be created in an election year; it is a time to analyze where the funding is going, who is responsible for spending it, and how they will be held accountable for their actions. It is not a time to blindly grant multi-million dollar loans to companies that administration officials know will fail; it is a time to scrutinize the potential use of every dollar so they are not wasted. It is not a time for crony capitalism, but rather a time for competent capitalism. Perhaps the case of Solyndra will serve to remind our government of a commitment to be responsible and restrained with the American people’s money.